This easy recipe for fudgy brownie bites tastes so rich! Full of dark chocolate, peppermint & coffee flavors, just like the festive holiday drink! No butter, oil, flour or sugar & just 23 calories! Since I’m constantly testing new recipes to share with you, there are always plenty of treats covering my kitchen counters and stacked inside of my refrigerator… But because there aren’t enough hours in the day for me to burn off all of the calories from every single cookie, muffin, cupcake, and scone that I bake, I put most of the goodies on paper plates to share with my neighbors. I had already moved on to testing holiday recipes! Flavors like cranberry orange, gingerbread, and peppermint mocha. Her entire face completely lit up with a huge smile as she heard that last one, and she revealed that peppermint mochas are one of her favorite drinks! We continued to chat a little longer, and she mentioned that she and her husband were going on a big trip to the Dominican Republic with his extended family. She sheepishly admitted that they were both trying to diet and spend more time at the gym in order to feel confident in their swimsuits… But it was SO hard with all of the tempting Halloween candy around! And the next day, I started working on these Healthy Flourless Peppermint Mocha Brownie Bites to give to them! 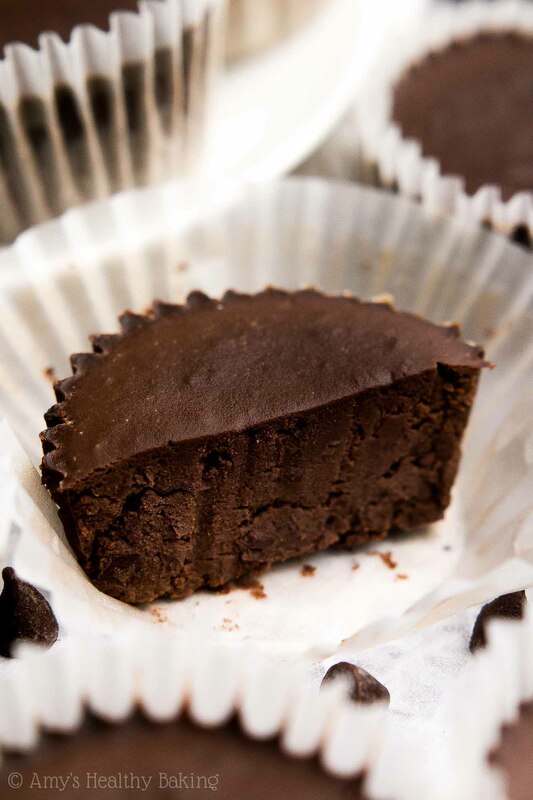 The bites are supremely rich and fudgy, exactly the way I love my brownies, and they’re super easy to make. 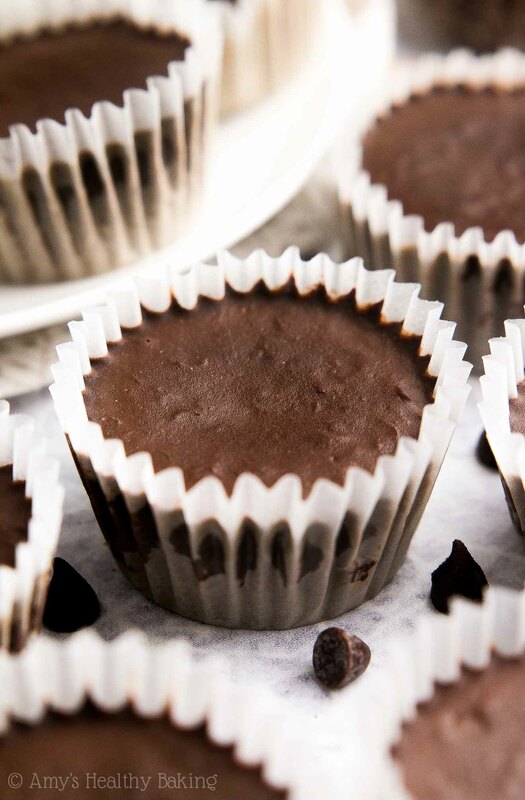 No melted chocolate required—and no butter, oil, or refined sugar either, for that matter! Even so… They still taste extremely decadent and indulgent, even with just 23 calories! ?? Before we start talking about this recipe, you have to promise me you’ll hear me out and give it a chance. Okay? Pinky promise?? The first ingredient that you need is black beans! Yes, I know. Black beans sound SO strange as an ingredient in brownies. Normally they’re reserved for enchiladas and taco salad and maybe even southwestern-style chili… But I’m telling you to put them in your brownies. Of course, you can’t make healthy flourless peppermint mocha brownie bites without some sort of chocolate… And because we’re making this recipe as easy as possible, you’ll skip the melted chocolate and just use cocoa powder (like this!). You’ll add 1 full cup, so these brownies taste extra rich and decadent. Exactly the way brownies should be! 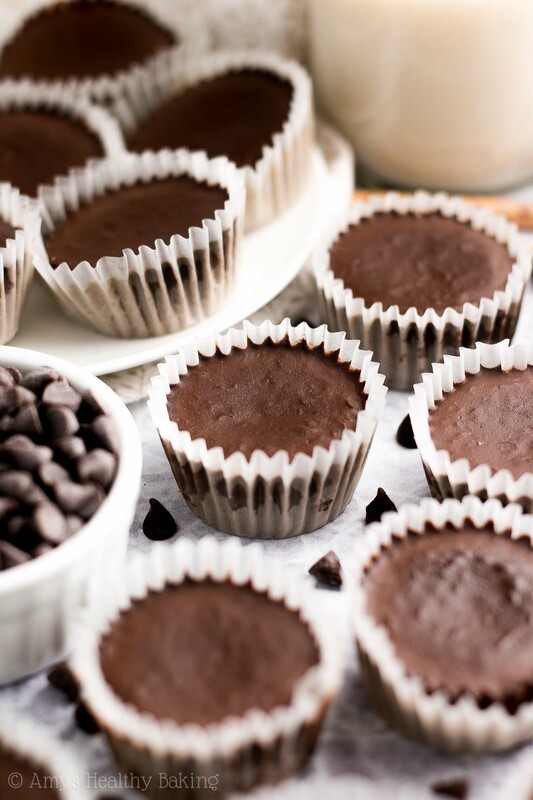 To keep these healthy flourless peppermint mocha brownie bites low carb, you’ll sweeten them with vanilla stevia (like this!) and powdered stevia (this kind!). While vanilla stevia is one of my favorite ingredients (and you’ll use it in all of these recipes of mine, too! ), I found it wasn’t quite strong enough on its own. The extra powdered stevia makes a big difference! And I’ve never detected any strange aftertaste in either the vanilla stevia or stevia powder like some stevia products can have. Total win! For the super important peppermint mocha flavor, you’ll also add in peppermint extract (like this!) and instant coffee (like this!). Do not substitute regular coffee grounds! They’ll make your healthy flourless peppermint mocha brownie bites taste gritty and coarse. You need the kind that dissolves in water! Here’s the best part… You just add everything to a blender or food processor. (I love mine!) Turn it on, watch as the ingredients turn into a smooth batter, and then pour it into your mini muffin cups. If using liners, remember to coat your cupcake liners with cooking spray! This ensures they properly peel away from your brownie bites. How rich and fudgy and decadent and perfect do those look?? ? And when you make your own, remember to snap a picture and share it on Instagram using #amyshealthybaking and tagging @amyshealthybaking IN the photo itself! (That guarantees I’ll see your picture! ?) I’d love to see your healthy flourless peppermint mocha brownie bites! 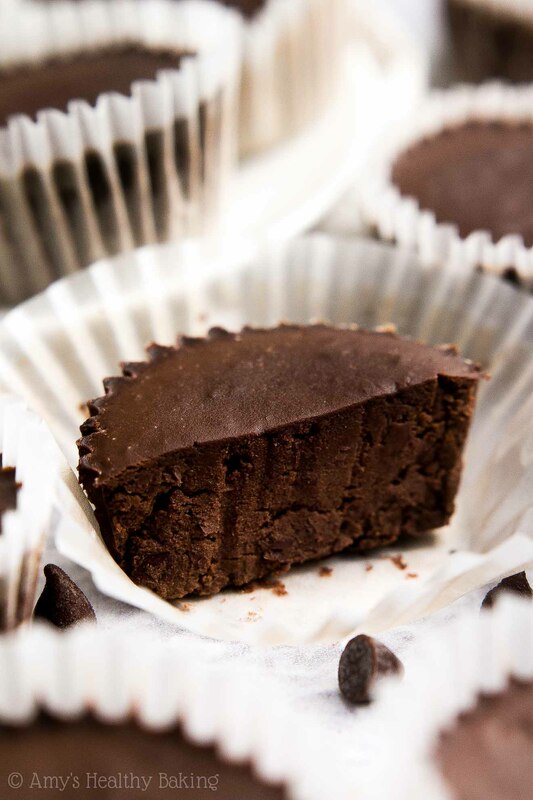 These brownie bites are supremely rich and fudgy, just like I prefer my brownies! They’re dark chocolaty (similar to 72% dark chocolate) with lots of peppermint and a hint of coffee flavor. They’ll keep for at least 5 days if stored in an airtight container in the refrigerator. 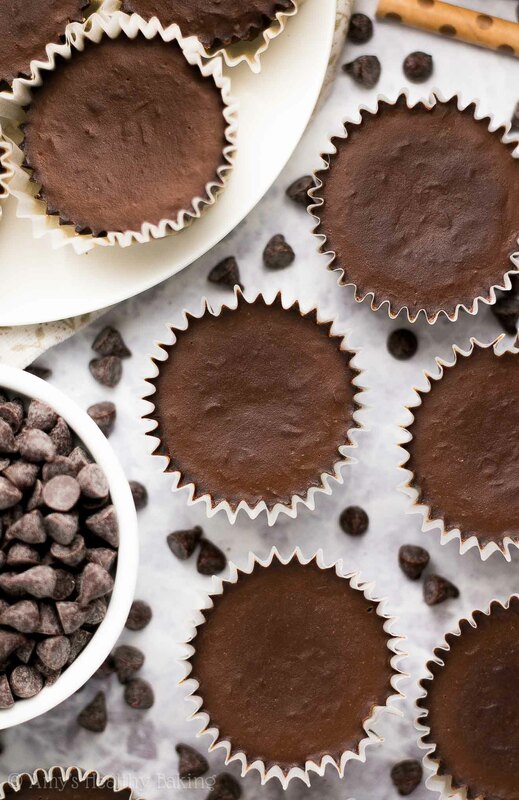 Preheat the oven to 300°F, and line 24 mini muffin cups with paper liners. Lightly coat the liners with nonstick cooking spray. Add all of the ingredients to a food processor or blender in the order listed. Blend until the batter is smooth and creamy. Pour the batter into the prepared mini muffin cups. Bake at 300°F for 9-13 minutes or until the edges look done and the centers still look slightly glossy. Cool completely to room temperature in the pan, and let the brownie bites rest for at least 4 hours once at room temperature for the fudgiest texture. 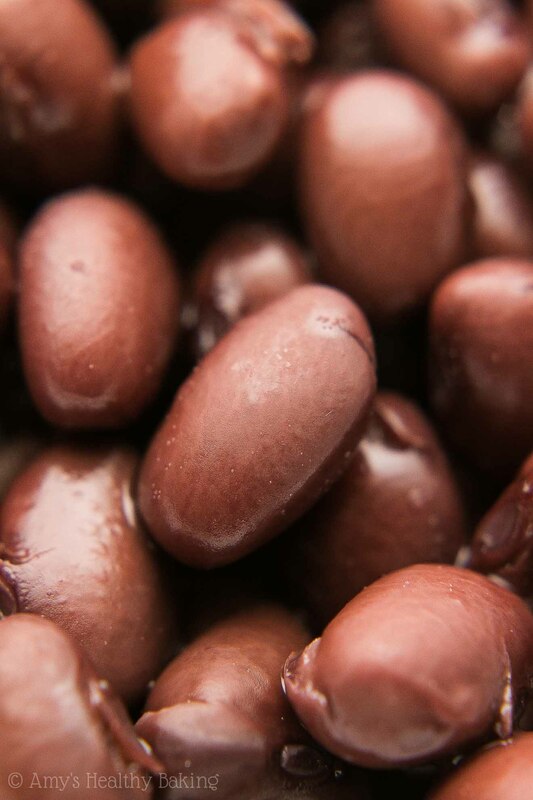 Notes: If you aren’t using canned black beans, then you’ll need 240g of cooked black beans. Measure the cocoa powder using this method or a kitchen scale. (← That’s the one I own and love. It’s the best $20 I’ve ever spent!) Too much cocoa powder will make your brownie bites taste bitter, rather than rich and chocolaty. Do not substitute regular coffee grounds or brewed coffee. The former will make your brownie bites taste gritty, while the latter isn’t strong enough to taste. You need the kind that instantly dissolves in water (like this, or this for a decaf version). For a stronger coffee flavor, increase the instant coffee by an additional 1-2 teaspoons. If you aren’t a fan of coffee, just omit it! I used this vanilla stevia and this powdered stevia. While vanilla stevia is one of my favorite ingredients (and you’ll use it in all of these recipes of mine, too! ), I found it wasn’t quite strong enough on its own. The extra powdered stevia makes a big difference! I buy mine online at the links I included above. If you don’t want to use the stevia products, then substitute ¾ cup (180mL) of pure maple syrup, honey, or agave. If using this substitute, then omit the milk. If you aren't a fan of peppermint, then just replace it with additional vanilla extract! 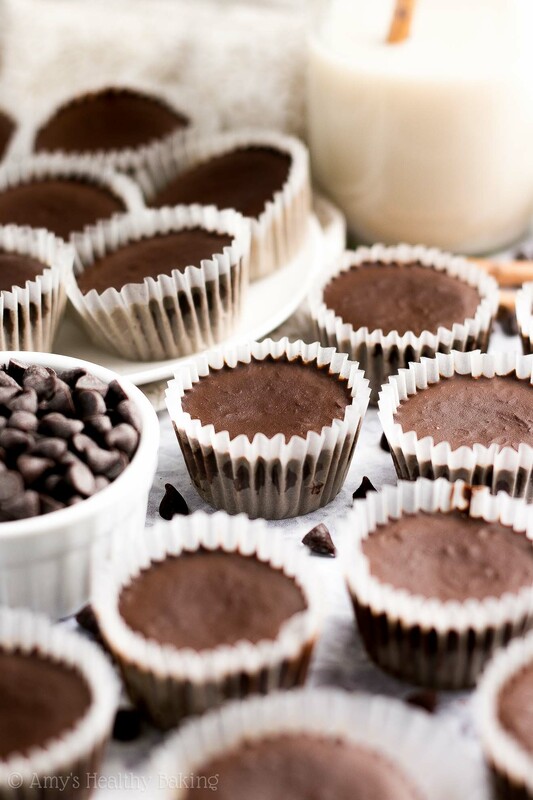 If you prefer, you can bake these in an 8”-square pan instead of the mini muffin cups. Bake at 300°F for 15-19 minutes. They’ll be done when the edges look baked through but the center still looks glossy and underdone. (It’ll continue to cook through due to the heat of the pan as the brownies cool to room temperature!) Once the brownies cool to room temperature, let them rest for at least 6 hours for the fudgiest texture. I love your tasty recipes! I love the cute look of those small brownies! Thank you so much Daisy! 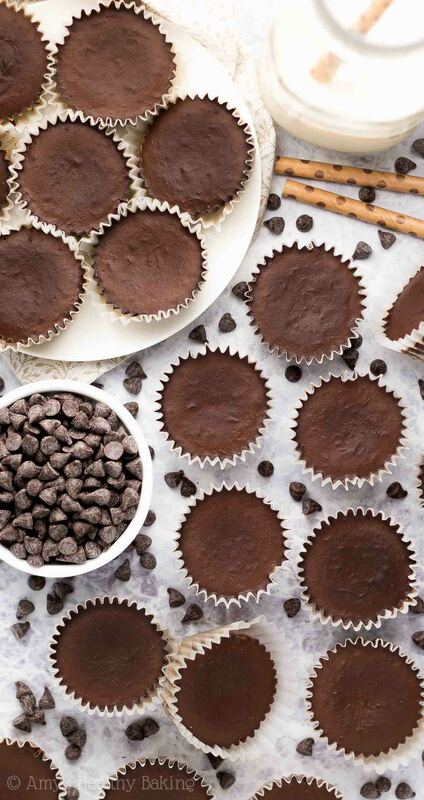 🙂 I’d love to hear what you think if you try these brownie bites! Has anyone actually made these? Maybe without the coffee and using honey in place of Stevia? As the recipe author, I’ve definitely made these! 😉 I’ve actually covered both of your ingredient questions in the Notes section underneath the Instructions. It can be easy to miss! 🙂 I’d love to hear what you think if you try these brownie bites! Hi! First I want to say how important a blender or food processor is. I don’t own either. I erroneously thought the kitchen aid mixer would take care of them! Must have been having a seniors moment! lol Do you think a magic bullet could be used to break down the beans, maybe in batches, then they could be added to the remaining ingredients in the stand mixer? Second, my stevia product is granular and measures 1:1 for sugar and I do not have the vanilla flavoured product. I still only used a total of 2 T + 1.25 tsp but did not think there was enough sweetness. Do you have a recommendation in this regard? I did measure the cocoa correctly but still found some bitterness. I think more sweetener may be the answer to counteract this but would appreciate your input as to the amount. The ingredients for the second try are anxiously awaiting my abuse so thank you for your help. linda. I really appreciate your interest in my recipe Linda! I don’t have any experience with a magic bullet, so I’m not the best person to answer that question. As for the stevia — yikes!! The vanilla stevia I used is the equivalent of ½ cup of sugar, and the powdered stevia that I used is the equivalent of ¼ cup of sugar. So if you only used 2 tablespoons + 1 ¼ teaspoons of your product, you were over ½ cup short. That’s why your brownie bites tasted so bitter! If you’d like to use your stevia product, you’ll need ¾ cup of that AND reduce the milk to ¼ cup. (If the brownie batter seems too thick, add an addition 1-2 tablespoons of milk.) I think that’ll really help with the flavor of your brownie bites! Well, I finally got around to trying this recipe again.This time I used an immersion blender for the mixture. Still had bits of bean skin; however, not too noticeable and I will just blend for a longer period next time and will gently tweak the chocolate/sweetener/peppermint ratios to appease my taste buds. I was able to find (finally) a Stevia product more in line with what you had used and got much better results than with the first product I used. BTW, I had six eaten before I made it to the computer to send this note. Thanks so much for sharing your recipe modifications Linda! I think that’s the best kind of compliment, if six of them disappeared before you made it to your computer. 😉 Thank you for sharing that with me! That really means a lot!